I am Service, Devotion and Compassion. Mary Magdalene, known also as Mary of Magdala is most widely known from her time with Jesus, she was one of the closest to him, even staying with him at the Crucifixion. She was the first person to whom Jesus appeared after his resurrection and the first to preach the “Good News” of that miracle. From other texts of the early Christian era, it seems that her status as an “apostle”, in the years after Jesus’ death, rivaled even that of Peter. Mary Magdalene is now Cohan of the 6th Ray, since 2012. She is re-instating her empowerment for humanity and those on the 6th Ray dedicated to Service, Devotion and Compassion around our World. Mary Magdalene is especially working with equal rights for both women and men through the spiritual, physical and mind. She brings self-confidence, strength, a deep feeling of self and re-assurance, opening new doors into your life and showing you a clear path with deep peace and re-assurance through her guidance. 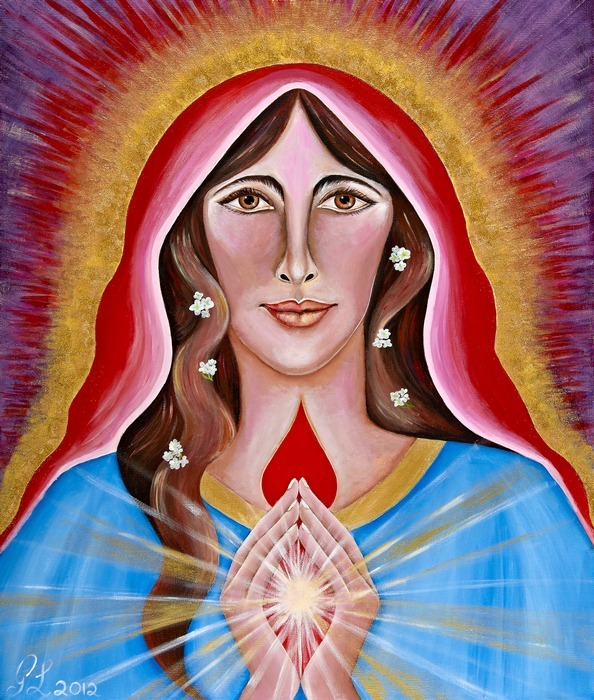 For those connecting with Mary Magdalene she comes forth very peaceful and is like your best friend, supporting you in every way. She is always willing to help anytime you need her. The portrait of Mary Magdalene shows her looking directly at you with loving guidance. She is saying through this portrait with her hands in prayer ‘I honor the divine in you now’. The ruby flame emanating from the tips of her fingers with compassion. Jasmine in her hair placed for re-assurance and assistance to move forward from Master Jesus, her twin flame.